Tiger’s Realm is a WMS designed slot machine, which chooses to focus on the tiger and its environment, but also on a number of other big cats, predators that the jungles will host. Things like flowers take up a decent number of symbols as well, so there is a mix of dangerous animals and delicate plants on the reels of the game, making this tiger’s realm appear quite interesting. 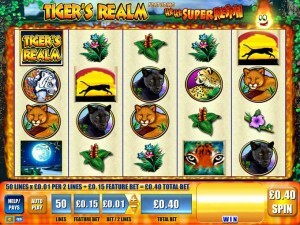 The slot gets 5 reels, 40 bet lines and as features you will find inside Respins, free spins, scatter symbols and the wild. If you win the big prize, you might be disappointed in it, since it will be worth only $750. 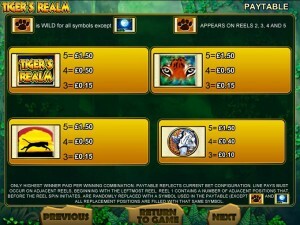 The game has a wild symbol, a scatter, Hot Hot respins and free spins. Overall, it’s a typical WMS slot machine in this part of the game. The Paw Print wild is present on the last four reels of Tiger’s Realm. The 2nd, 3rd, 4th and 5th reels are the ones that can host it, and it will substitute for other symbols when this happens, but it will not be capable of offering prizes directly since it doesn’t appear on the 1st reel and you can’t get enough of its symbols to form a wild combo. The other major symbol of the game would be the scatter, using the image of the Full Moon. The ability it has is to appear anywhere on the reels where it is allowed, and if you have all of them in place you get your prize. You need the scatter on the 1st, 2nd and 3rd reels in the same round, to get its prize. 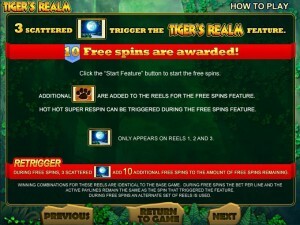 The reward consists in 10 free spins, which you can even retrigger if you have all three scatters present again. 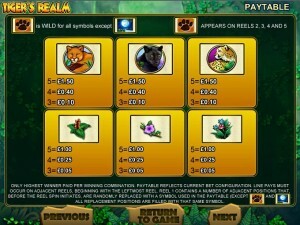 Extra wilds are placed on the reels during the free spins. This particular feature requires that the 1st reel has only matching icons on it. If that happens, the 1st reel becomes sticky, remaining there while the other four reels spin for free a total of two times. If there are symbols identical to the ones from the locked reel, they become sticky as well until the feature is over. With each new spin, the payouts become better and better. The slot’s bets are on the high sides if you use the maximum coin denomination of $5, since the 40 lines require a total of $200 in that case. However, use a denomination that is lower, as small as $0.01, and the bet value becomes manageable. One of the things that might annoy you would be the value of the prizes, which go up to 150 coins only, meaning $750 cash. It’s not a lot of money for a slot which asks for $200 bets per spin. The game has a clean and attractive design, with the small symbols with flowers and felines having an eggshell yellow like space between them. You see a sample of the land where the tiger is the true king, if you look at the background picture. Among the symbols, besides the flowers, you will see images of white tigers, mountain cats, panthers, leopards and so on. 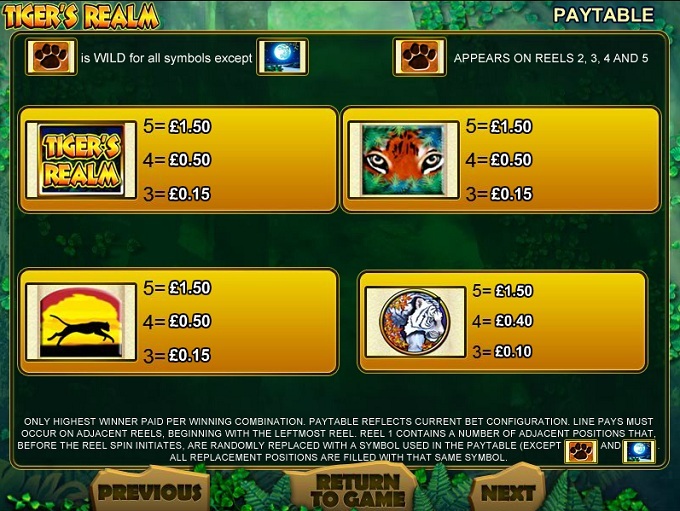 Symbols: Paw Print (wild), Full Moon (scatter), Tiger’s Realm Logo (150 coins), Tiger Eyes (150 coins), Feline Profile (150 coins), White Tiger (150 coins), Mountain Lion (150 coins), Black Panther (150 coins), Leopard (150 coins), Red Flower (100 coins), Pink Flower (100 coins) and Blue Flowers (100 coins). The nature angle was approached well here, and the result is a game whose design makes it easy to enjoy it. However, the prizes are a big disappointment, and I wouldn’t recommend you play it because of them. 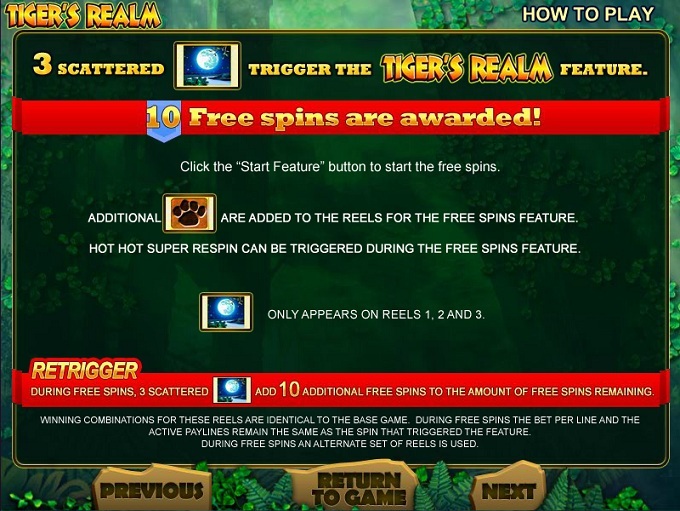 This Tiger’s Realm slot is offered by all online casinos with WMS software, playable either in practice or in real money mode.